Anyone who knows me knows that I'm a sucker for great packaging. And I must say that Guerlain does great packaging like no other. Every single product from this brand feels so beautifully luxurious, you feel terrible using it because then it will disappear! (Case in point: the Guerlain Mysterious Butterfly Eyeshadow Palette from Spring 2009. Have you ever seen anything more beautiful?) Well, I've recently come across two more products to add to my Guerlain stash ... find out what they are after the jump. First up, Guerlain L'Or Radiance Concentrate with Pure Gold ($70). Before I even get into the amazingness of this product, let's just take a minute to admire its beauty, shall we? 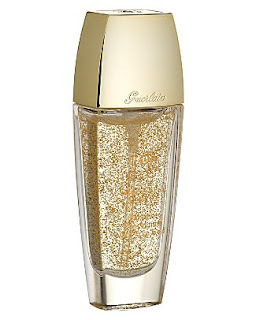 Drops of pure gold are suspended within a clear liquid, creating an unbelievably amazing prismatic effect that just gleams and glistens from anywhere on your nightstand or vanity. I have to admit it's tough for me to advocate using something this gorgeous ... though I did, in the interest of bringing you a true and honest review. And though it pained me to pump out even a small fraction of this serum, I did ... and to amazing results! It gives skin an evenness and a glowy radiance that could only come from massaging pieces of gold into its outer layers, all while smelling like freshly cut roses. Only a very small amount is necessary to achieve the desired results -- which is good, since you'll want this to last for months and months! 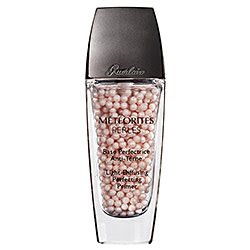 Moving on, we have the Guerlain Meteorites Light-Diffusing Perfecting Primer ($71). Again, the packaging is so luxe, it becomes hard to even use the product! Tiny pink balls are suspended in a clear floral-scented serum, giving it a playful and fun look that's still completely uppercrust. But once you bring yourself to use the primer, you'll be amazed at the results. A pale creamy pink liquid pumps out of the bottle, and trust me, you only need a very small amount to make skin glow. Once applied, skin will be even and left with a subtle shimmer that will have everyone wondering about your secret to perfection. I have been wanting to try the light diffusing primer. I use meteorites as my powder. I try to use them sparingly but I get so many compliments when I have them on that it's hard to resist. But they are awfully pretty in their little colored pearls form that it's difficult to smash them!